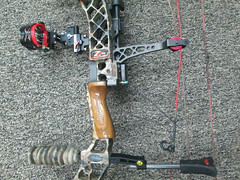 I have a bet going with my buddy chuck.. and the payout is going on an archery elk hunt this year. I shot as a kid.. but haven't in 25 yrs I guess? Last edited by sunofnun; 01-29-2015 at 08:43 PM. Speaking of Archery, just saw this a couple days ago. Just got into it myself, and have been playing in the yard. I got a Diamond Archery "Core" and it's been pretty fun, despite how bad I am at it. You're welcome to come out and play. I've got a target and such. Next thing I need is a stand for arrows and bow while I shoot. I think I'm going to get creative with some of the wood I have laying around this weekend if I get a chance. Sweet. lets do some damage. My buddy chuck will likely tag along. Wow, that's some bow! I've got two older models, can't hit the side of a barn. 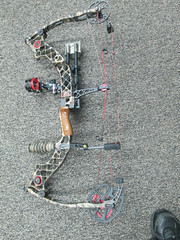 I also have a 150# crossbow, never shot it yet. I'm working my way through the honey-do list today so I can do some shooting tomorrow morning, if you're interested and the weather holds. shoot.. just saw this. Got my kids, and we're doing pre-superbowl brunch. could be in for next weekend. Yeah, Sunday should work if the weather is nice. weather is out for Saturday, and I'm on the hook to help a friend with the fact that she just bought a house on Sunday. another time. FUK THIS RAIN....looks like we might see the sun next tues..
my groups are tightening up, but now I'm hitting arrows against each other more often--and I broke 2 yesterday. I finally got some arrows.. need to pick up some practice tips in different weights to see what works best for me. Shot for the first time in a couple months last night. Holy crap my arms have gotten weak. Really felt good, needed it. Ive lost lots of arrows so far..
try scooting up or finding a better backstop? I'd have lost a few more if that tree wasn't there. yeah, I was definitely shooting with open forest behind the target..